Kareena Kapoor is currently shooting in Delhi for her upcoming film Veere Di Wedding. Directed by Shashanka Ghosh, the film also stars Sonam Kapoor, Swara Bhasker and Shikha Talsania in leading roles. Kareena brought in her birthday with the VDW cast, and boy! it seems like they had fun. Veere Di Wedding is slated for a 2018 release. Yuvraj Singh shared this picture with Kajol on social media. His flight reportedly got delayed and he got a chance to click a pic with his "favourite actress". Kajol was last seen in Dhanush-starrer Tamil film Vellailla Pattadhari 2 (VIP 2) in an antagonistic role. 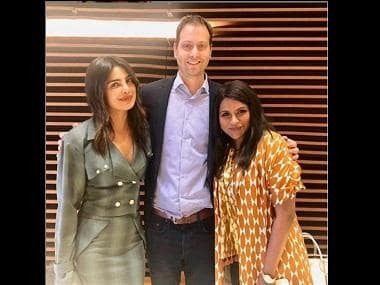 Priyanka Chopra, being a UN Goodwill Ambassador, was part of an event during the United Nations General Assembly session of 2017. The event was an initiative to eliminate violence against women and girls. Malala was also part of the same panel discussion. Ribbon revolves around a modern-day couple and delves into various complexities that arise in a relationship in the world of technology and social media. The film is directed by Rakhee Sandilya and marks Sumeet Vyas' first turn as a lead actor in a Bollywood film. Vyas has earlier worked in films like English Vinglish and Parched. This installment of Rohit Shetty's comedy franchise Golmaal will feature all the five male actors — Ajay Devgn, Arshad Warsi, Kunal Khemu, Shreyas Talpade and Tusshar Kapoor. Tabu and Parineeti Chopra will also join the bandwagon with this film. Neil Nitin Mukesh plays a pivotal role.